Best known for his children’s books, WHERE THE WILD THINGS ARE and IN THE NIGHT KITCHEN, Maurice Sendak has spent the past fifty years bringing to life a world of fantasy and imagination. His unique vision is loved around the globe by both young and old. Beyond his award-winning work as a writer and illustrator of children’s books, Sendak has produced both operas and ballets for television and the stage. Born in Brooklyn, New York, to Polish-Jewish immigrant parents, Sendak was a frail and sickly child. Spending much of his young life indoors, he turned to books at an early age. His view of the outside world was often limited to the family that came to visit him and the little that he could see from his window. It was during this time that he began to draw and to allow his imagination to run free. At age twelve, he went with his family to see Walt Disney’s FANTASIA. This animated world, constructed completely of invented characters and fantasy, had a great influence on him. Throughout high school, Sendak continued to draw, and after graduating, published a handful of illustrations in the textbook ATOMICS FOR THE MILLIONS. In 1948, he began working for F.A.O. Schwartz as a window dresser and continued there for four years while taking night classes at the New York Art Students League. After finding work illustrating Marcel Ayme’s THE WONDERFUL FARM and Ruth Krauss’s A HOLE IS TO DIG, Sendak left F.A.O. Schwartz to become a full-time, freelance children’s book illustrator. Throughout the 1950s, Sendak worked regularly, producing nearly fifty illustrated children’s books. He saw in book illustration the opportunity to expand the imaginary world of the reader. While many illustrators had concentrated on clarifying the images in the text, Sendak believed that an illustration should add to the mystery of the work. His oddly grotesque characters seemed strangely inviting in their imperfections. Unlike much of the Disney cartoons and the illustration that followed it, Sendak’s artistic imagery brought a self-conscious attention to its origin and its maker. By the early 1960s, Sendak had already gained a following as one of the more expressive and interesting illustrators in the business. In 1963, his book, WHERE THE WILD THINGS ARE, brought him international acclaim and a place among the world’s great illustrators. For this project, Sendak worked as both the illustrator and the writer. It is the story of a young boy named Max, who is sent to his room only to find his imagination has created a new world there, populated by wild geographies and monsters of all kinds. Initially, its graphic portrayal of the toothy wild things concerned parents, but before long it was a favorite among children everywhere, having been translated into fifteen languages and selling more than two million copies. Over the following years, Sendak created dozens of popular children’s books including one of his best known, IN THE NIGHT KITCHEN (1970). 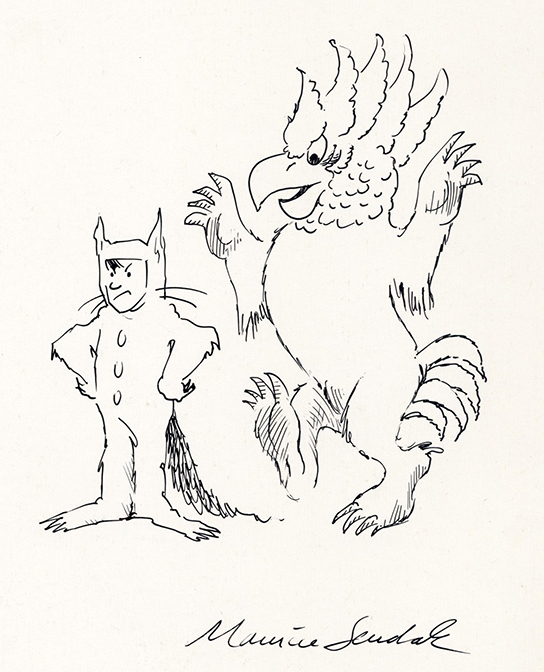 In the late 1970s, Sendak turned his attention to other forms. While continuing to write and illustrate, Sendak began producing and designing performances. Incorporating much of the same imaginative design that had made his books so popular, Sendak put on a number of operas, including Mozart’s “The Magic Flute” and Prokofiev’s “Love for Three Oranges”. In 1979, he turned his book, WHERE THE WILD THINGS ARE into a popular opera, and four years later designed a winning production of Tchaikovsky’s ballet “The Nutcracker”. Throughout the past fifty years, Maurice Sendak has been one of the most consistently inventive and challenging voices in children’s literature. His books and productions are among the best-loved imaginative works of their time. Like the Grimm brothers before him, Sendak has created a body of work both entertaining and educational, which will continue to be popular for generations.